The best golf trainer can only do so much. What each beginning golfer really needs is to put all of those theories, tips and lessons into practice. And that’s where the SKLZ Rick Smith Smash Bag comes into play. The SKLZ Rick Smith Smash Bag is basically a smash bag impact trainer that helps beginning golfers learn the correct clubface impact. It lets you do this by letting you feel the proper impact of your clubface as you make each swing. The SKLZ Smash Bag was designed with beginners and even intermediate golf players in mind. This is one of the reasons this product is very simple to use and very straightforward. All you need to do to start using the Smash Bag is to line up and take a swing. You can then see just how you did after your swing. The Smash Bag provides instant feedback on each of your swings. After you line up and take a swing, you will be able to look at the angle of the target map and see just how you did. If you executed the right swing, the Smash Bag will remain aligned. However, if you miss the target or hit the bag at a skewed angle, then you can still analyse the depression on the bag. Being able to see just how you do on each swing will make your practice even more effective. Obviously, there are other products in the market similar to the SKLZ Rick Smith Smash Bag. However, another thing separates the SKLZ Rick Smith Smash Bag from the rest…the price. And considering that the Smash Bag is made of heavy-duty, high impact material, this piece of equipment will be with you as long as you will need it. By letting you feel the proper impact of your clubface as you make each swing, the SKLZ Rick Smith Smash Bag will help you eliminate the fat and thin shots that you make and cure your slices. By giving you the visual feedback that you need, you will be able to adjust your swings. Pretty soon you will be able to memorize the right way of making the swing. You will be more accurate, more confident with each swing. 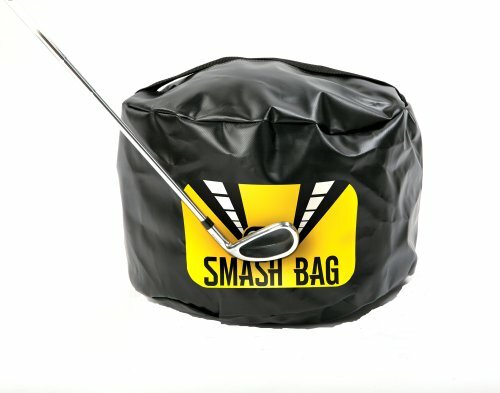 When your swings feel a little off, you can easily correct your swing by taking a few practice swings at the Smash Bag. Simply keep the SKLZ Rick Smith Smash Bag near your practice tee area to help you get focused. A regular practice swing won’t be able to help you in the same way. So keep your golf swings crisp by taking the Smash Bag along with you during your practice. Whether at home or in the practice range, the SKLZ Rick Smith Smash Bag is pretty much a great addition to your golf training equipment. It’s great price also means that everyone will be able to afford it. Getting the proper training shouldn’t be complicated or expensive…and that’s why the SKLZ Rick Smith Smash Bag is popular with beginner and intermediate golfers. Find A Great Deal On Your SKLZ Rick Smith Smash Bag Right Now!